Earlier this week we talked about Simon pants, I was a bit meh. 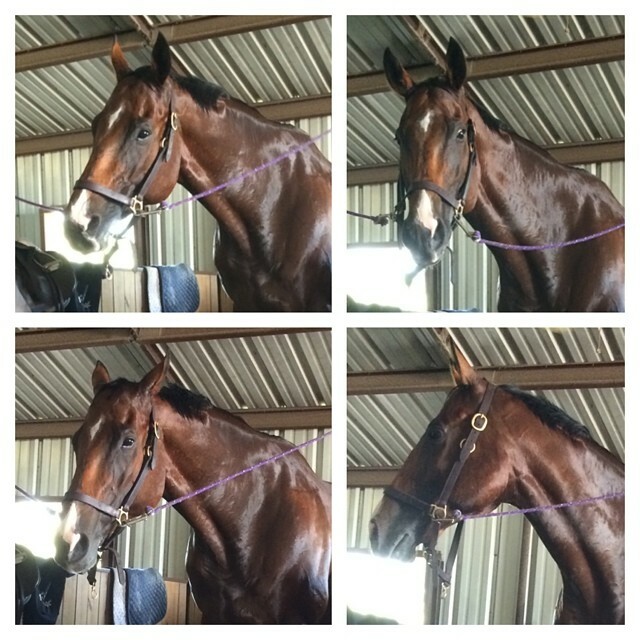 I basically made the decision to do some easy (read: inexpensive) things to further try and fix our problem, try to stop being so neurotic about it and essentially ride him until it goes away or gets bad enough to really dive in and diagnose. Five days later, I am feeling pretty optimistic. First in my plan of attack was to get Jen to ride him to get her opinion on the state of things. If you want to read about that, check out her blog post… but the summary is he did the funny step for her but like me, she didn’t feel it was pain related. Her assessment validated to me that he does do it with lighter riders, but also that the more he works and the more properly he goes… the less he does it. Then my farrier came out special for Simon and we squared off the toe on Simon’s hind feet. After I saw the new shoes, they looked lovely and I was cautiously optimistic. My farrier told me Simon had grown a lot of toe, and he took quite a bit off in addition to moving the shoe back slightly and squaring the toe. Thursday was my first post-shoes ride, and Simon felt fantastic. He only did the funny step behavior twice during our ride, and to say I was elated is an understatement. He basically felt like normal Simon (who is not always perfect in his hind due to his pre-existing issues) and I felt like I had my horse back! The footing was also exceptional in our ring that night, so I’m sure that had a part to play as well. So now I’m feeling officially less gloom & doom about my horse. Yes, he has some weirdness and some issues… but a lot of that is just him. I can live with it, because he is the bestest. 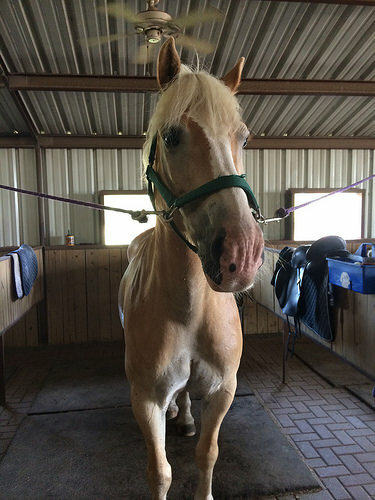 Since Jen is temporarily boarding her adorable Paddington with me, I also get to ride what I affectionately call “the Anti-Simon.” Not sure you could create a horse more different than mine… but look how cute he is! I like riding Paddington, because he reminds me of a horse I rode as a kid. 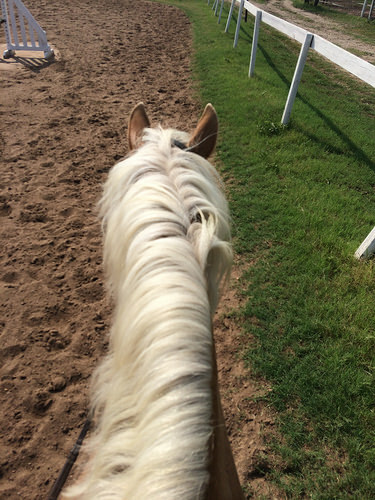 Just looking down on a thick palomino mane gives me a huge waft of nostalgia. Plus, all this sitting the Haffie power trot in Jen’s dressage saddle is really good for my abs. Riding a cutie plus an ab workout? I’ll take it! Fingers crossed for you!! And Paddington is adorable. Yay for Simon doing better & Paddy is fab isn’t – two adorable ponios! I had to catch up on what was going on with the S-Man but I’m glad to see you guys have been figuring it out. Sounds like you’re heading in the right direction. And Paddington is adorable. Great news all around!! Plus so jealous of your rides on Paddy! Thanks so much for riding Paddy! And yes, he pretty much is the anti-Simon. Also SO glad to hear that Simon is doing better. I think the changes you are making are good ones and will definitely help him in the long run. Go Simon Go! you know I’ve been advocating the ride until it gets better or really worse for a while now, so I’m glad to see you’ve decided that and that it is getting better 😉 we call it ‘bridle lame’ at my barn, as in, they aren’t REALLY lame, pain wise, they’re just either (a) being lazy and not wanting to use their body correctly, or are (b) compensating for weakness etc. and usually just really making them use themselves correctly long enough will develop enough strength to make it go away. Wiz takes funny steps when I don’t ride him enough because his hind end gets weak from that EPM :\ But once I get him back into a regular program, it disappears. I’m so glad that Simon is doing better! Paddington is beyond adorable! I am SO THRILLED to hear this! Yeah Simon! Yay! I’m glad to hear this! Hooray good news! You were due for some of that. Plus haffie rides just make everyone smile.